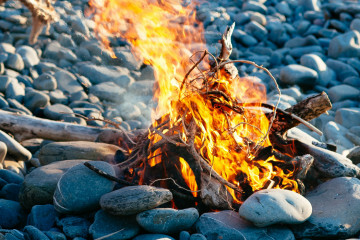 Get the whole family in on this fun storytelling campfire game! necessary, but will definitely add a fun feel to the game! This game is for the whole family! Round your kids up outside and have everyone sit in a circle around the “campfire” or in the space you created. Set your timer for 45 seconds. Starting with an adult, each person will hold the ball or object and say, “I’m going on a camping trip and I’m bringing _________” (an item he would like to bring). He must then pass the object to the next person. Go around the circle, quickly sharing what each person would bring. Whoever is holding the object when the timer goes off is out. Repeat this until only two people are left. Once you reach the final two, cut the timer to 30 seconds. The last person in the game wins! come from it — eating food, playing games, and laughing with family and friends. But there is nothing quite like storytelling around a campfire. Storytelling is something we can’t get enough of; everywhere we look, people are telling stories — from books, to music, to movies, to advertising. Of all the stories that surround us, there is one more exciting and fulfilling than any other: the story of God. God’s story is vast — encompassing all of history — and full of battle, love, and redemption. Perhaps one of the most incredible things about it is that He invites us to be a part of it! As you round out your night, encourage your children to remember that storytelling is fun, and is something we were created to do. There is nothing better than knowing that God has given each of us a very special story that we get to share with others to glorify God!